The 2019 list of Fellows of the Royal Society has now been announced, and that means it’s time for us to spend a couple of minutes looking up which of them work in mathematics, the boss of sciences. The new Fellows, who join a hugely prestigious list of great scientific thinkers (and Elon Musk), are being recognised for their “substantial contribution to the improvement of natural knowledge, including mathematics, engineering science and medical science”. The FRS has been described by The Guardian as “the equivalent of a lifetime achievement Oscar”. 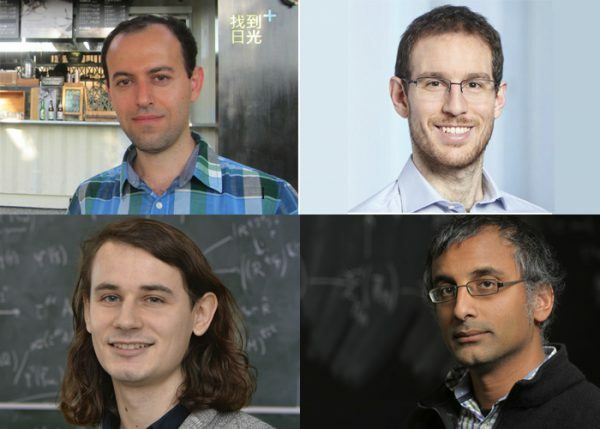 This year’s intake includes three Fields medalists – Caucher Birkar (Cambridge) and Ashkay Venkatesh (Princeton) from 2018, and Manjul Bhargava (IAS) from 2014 – as well as Christopher Hacon (University of Utah), Peter Haynes (Cambridge), Roy Kerr (Christchurch, NZ), Jack Dongarra (Tennessee/Manchester), all working in mathematics or applied maths. There’s also medical statisticians Sarah C. Darby (Oxford) and Robert Tibshirani (Stanford), as well as six physicists and three computer scientists. This week, Katie and Paul are blogging from the Heidelberg Laureate Forum – a week-long maths conference where current young researchers in maths and computer science can meet and hear talks by top-level prize-winning researchers. For more information about the HLF, visit the Heidelberg Laureate Forum website. The HLF included a talk from 2018 Fields medalist Caucher Birkar. His subject area, algebraic geometry, is one of the largest fields of research within pure mathematics (over a quarter of the 60 Fields medals awarded since 1936 have been to people working in algebraic geometry), and it has connections to many other fields of maths including topology, algebra and number theory. But what exactly is algebraic geometry? Well, if you’ve studied maths at school, there’s a pretty good chance you’ve already done some.